Today in Masonic History Douglas Fairbanks is born in 1883. Douglas Fairbanks was an American actor. Fairbanks was born Douglas Elton Thomas Ullman in Denver, Colorado. Fairbanks father, Charles, was an attorney from a prominent Jewish family in Pennsylvania. Charles would meet Fairbanks mother, Ella, when she married her first husband, a wealthy plantation owner. After the passing of Ella's first husband, John Fairbanks, she was swindled out of the family fortune by her late husbands business partners. Ella's would marry a second time before marrying Charles. After the marriage, Charles convinced Ella to move to Colorado. When Fairbanks was 5 Charles would abandon his family. Ella would change her son's last name to Fairbanks in honor of her first husband. Fairbanks began acting at an early age. He performed in summer stock, becoming a sensation in his teens. He attended Denver East High School, leaving in his senior year. It was claimed that he attended Harvard University. In the early 1900's, Fairbanks moved to New York to pursue an acting career. He worked odd jobs until he made his Broadway debut in 1902. In 1907, Fairbanks married Anna Beth Sully. 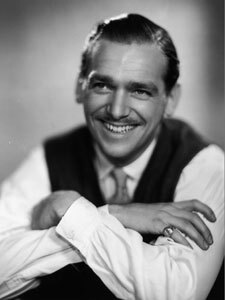 The couple had one son Douglas Elton Fairbanks, who would later be known as Douglas Fairbanks Jr. In 1915, Fairbanks moved his family to Los Angeles. He was immediately signed on a contract with Triangle Pictures. His first film was The Lamb. The following year Fairbanks established his own studio, the Douglas Fairbanks	Film Corporation. Also in 1916, Fairbanks met Mary Pickford, the two immediately begin having an affair. In 1917, Fairbanks and Pickford would join their friend Charlie Chaplin selling War Bonds across the United States. At the time Pickford and Chaplin were the highest paid stars in Hollywood. The following year Fairbanks would become the third highest actor in Hollywood. In 1919, Fairbanks, Pickford, Chaplin and D.W. Griffith formed United Artists. The four formed the film company to maintain artistic control, to control distribution and to control profits from their films. In the first year of United Artists, Fairbanks films would keep the newly formed company afloat. It was also in 1919 that Sully, Fairbanks first wife, would be granted a divorce. Fairbanks wanted to immediately marry Pickford, unfortunately she was still married. After an ultimatum from Fairbanks in 1920, she got a divorce from her husband in Nevada. Due to legal complications, the divorce would not be recognized until 1922. The couple married shortly after the divorce was finalized. Pickford and Fairbanks honeymooned in Europe and everywhere they went they were greeted by massive crowds. They had become the first celebrity couple. In the 1920's Fairbanks continued to make films. In 1926 he made the first full length Technicolor film, The Black Pirate. In 1921, Fairbanks, Pickford and Chaplin established the Motion Picture Fund to help those in the industry who could not work or were unable to meet their bills. In 1927, Fairbanks and Pickford were the first to put their hands in wet cement in front of the Grauman's Chinese Theatre. That same year Fairbanks was also elected to be the first president of the Motion Picture Academy of Arts and Sciences. He would later that year present the first Academy awards. Fairbanks last silent film was in 1929, The Iron Mask, the sequel to his earlier The Three Musketeers. Fairbanks would go on to make sound films, although none of them were very popular. His last film was The Private Life of Don Juan, in 1934. In 1933, Fairbanks began having an affair with Sylvia Ashley. He separated from Pickford and the two would officially divorce in 1936. On December 12th, 1939, Fairbanks had a heart attack and passed away in his home later that same day. Fairbanks was a member of Beverly Hills Lodge No. 528 in Beverly Hills, California.